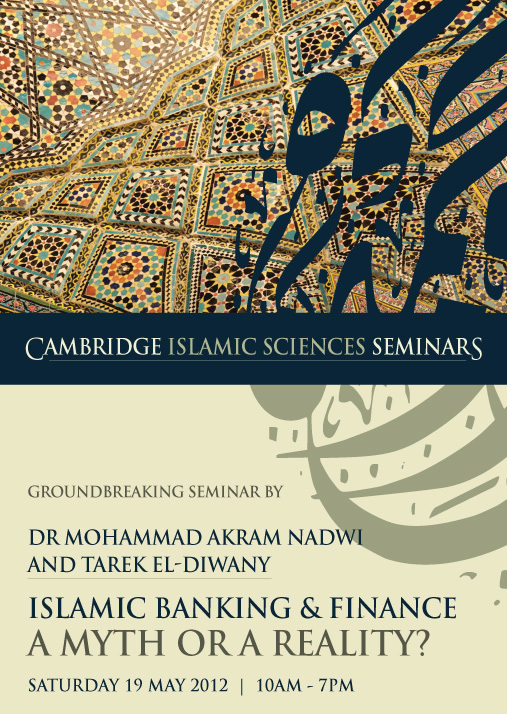 Cambridge Islamic Sciences: Money, Trade, Insurance & Finance in Islam - You Must Know! Money, Trade, Insurance & Finance in Islam - You Must Know! There is a fundamental principle in Islam which states: "It is compulsory to learn the fiqh (etiquettes and rulings) of a thing if one is engaged or planning to engage in that thing". Therefore if someone has to perform hajj, they need to learn the fiqh of hajj and if someone is getting married they need to learn the fiqh of marriage and family life, and so on and so forth. We are all engaged in money matters on a daily basis, whether it is banking, trade, insurance or finance. Why is it that we take these practices for granted and we do not give them due consideration and learn the fiqh related to them? For instance, almost every adult Muslim in this country has a bank account but how many know the fiqh of banking? Muslims participate in different types of home-financing schemes from shared-ownership to conventional mortgage or its Islamicised version. Or some, including students, take loans and others invest in pension plans. But do we know the fiqh of finance? Similarly, Muslims run businesses or we are employed in businesses or we deal in Ebay auctions and other online business but do we know the fiqh of trade and business? Often, too, we may be taking action simply following advertising campaigns for home-insurance, car-insurance, boiler-cover or breakdown-cover. But have we looked into the fiqh of insurance? Muslims living in this day and age are constantly faced with decisions regarding matters of money, banking, trade, insurance and finance. For us, knowing the fiqh related to these matters is not just 'a good thing to know' but it is essential and a must as it is linked to our worship and our servitude to Allah (SWT). The Prophet Muhammad (PBUH) said "Allah is Pure and He only accepts that which is pure". If our lifestyle, sustenance, clothing or shelter were to be tainted with the impurities of money and finances, then we are putting our very worship and servitude to Allah at risk and we would suffer the effects of this in every aspect of our life (refer #10 of 40 Hadith). If you are concerned, then the forthcoming seminar on finance and trade by Shaykh Dr Mohammed Akram Nadwi and Tarek El-Diwany is essential for you. What is stopping you from attending this once-in-a-lifetime seminar that would help bring barakah (blessings) in your finances and contentment in your life?